formerly Bishop of New Guinea. Reproduced online by kind permission of the Most Reverend the Archbishop of Papua New Guinea, 2007. The Revd. Vivian Frederick Barnes Redlich. The Revd. John Frederick Barge. Sister May Hayman. Miss Lilla Lashmar. The Revd. E. C. Rowland has done a good service in writing this brief story of the New Guinea Martyrs. There is much more yet to be told, and I hope one day we may have a fuller account of the heroic courage and steadfastness of each one of those gallant Missionary Servants of Christ who could have saved their lives and gone to safety when the going was still open, but who firmly resolved to cling fast to their vocation, and refused to leave the country and the people to whom God had sent them. Various accounts and references to our New Guinea Martyrs have been made in the past, and these in some particulars have been inaccurate. The great merit of this short account is that it does, as far as possible, accurately set out, in historical sequence, the events as they happened. 1. The death of the Revd. John Barge, who was killed in New Britain, probably earlier than August, and whose grave is marked on a Mission Station in New Britain near the Mission Station of Apugi and the Government Station of Kandrian. 2. The death of the Revd. Henry Matthews and his Papuan helper, Leslie Gariadi, who were killed at sea on the Feast of the Holy Name, August 7th, 1942, between Port Moresby and Daru. 3. The death of Lucian Tapiedi, the Papuan Teacher, early in August. He was killed by his own people when he stood up for the Missionaries he was accompanying from Sangara and Isivita. His grave was found and, though he was not with the Gona Missionaries but with those from Sanagara and Isivita, his body was re-interred next to the graves of the two Gona Missionaries at Sangara. 4. The death shortly afterwards of those from Sangara and Isivita whom Lucian was accompanying--the Revd. Henry Holland and Mr. John Duffill, of Isivita; the Revd. Vivian Redlich; Sister Margery Brenchley and Miss Lilla Lashmar, from Sangara, who were beheaded on the Buna beach. Their bodies were not recovered, as it is believed they were thrown into the sea. 5. The death of the two Gona Missionary Sisters, Sister May Hayman and Miss Mavis Parkinson, who were killed at Jegarata, near Popondetta, probably a little later in August. Their bodies were recovered and re-interred on the old Sangara Mission Station. I knew intimately all those who suffered and died in Papua; they were my dear fellow workers in Christ, and I know the strong faith and deep conviction that animated them in their resolution. Without doubt they were all good soldiers of Jesus Christ. In their deaths they have glorified God and have helped to save His Church which is the Body of Christ in New Guinea. We praise and magnify God for them every year on September the 2nd, the Feast of the New Guinea Martyrs. The Clergy of the Diocese of New Guinea, assembled in Sacred Synod in August, 1946, asked me to appoint a day for them to be so commemorated each year, and a proper with Collect, Epistle and Gospel for use on the same. The Provincial Synod of the Province of Queensland in October, 1946, commended the observance of this day to the Church in the Province and to the wider Church beyond the Province. The advance of the Japanese armed forces through South-East Asia in the latter part of 1941, threatened the peace and security of New Guinea. The capture of Rabaul on January 23rd, 1942, brought the danger ever nearer and, as the Anglican Missions were working in the north-eastern regions of Papua, it was realised that they would be the first to suffer in Papua. The population of Samarai, the commercial centre of Papua, 250 miles east of Port Moresby, was evacuated by Government order a few days later and, as the diocesan office was based there, the office was closed and transferred to Dogura, the Cathedral centre, on January 30th. On the day following this evacuation the Bishop of New Guinea, the Rt. Revd. Philip Strong, thought it wise to broadcast a message to his staff. It had been customary for the Sub-Dean of the Cathedral, the Revd. John Badger, to be on the air each day, once in the morning and again in the afternoon, to pass on news and information to the staffs of mission stations which were equipped with radio. The Bishop asked him to notify staffs that at 3.30 p.m. that day he, the Bishop, would broadcast the message. After lunch he sat down to draft the message, and he records that he felt divinely inspired to give more than just a report. As he took up his pen, the words of the now historic message came forth in full flood. At 3.30 p.m. he went on the air. "As far as I know, you are all at your posts, and I am very glad and thankful about this. I have, from the first, felt that we must endeavour to carry on our work in all circumstances, no matter what the cost may ultimately be to any of us individually. God expects this of us. The Church at home, which sent us out, expects this of us. The Universal Church expects it. The tradition and history of missions requires it of us. Missionaries who have been faithful to the uttermost and are now at rest are surely expecting it of us. The people whom we serve expect it of us. Our own consciences expect it of us. We could never hold up our faces again if, for our own safety, we all forsook Him and fled when the shadows of the Passion began to gather round Him in His Spiritual and Mystical Body, the Church in Papua. Our life in the future would be burdened with shame and we could not come back here and face our people again; and we would be conscious always of rejected opportunities. The history of the Church tells us that missionaries do not think of themselves in the hour of danger and crisis, but of the Master Who called them to give their all, and of the people whom He trusts them to serve and to love to the uttermost, even as He has served and loved to the uttermost. His watchword is none the less true to-day as it was when He gave it to the first disciples, `Whosoever will save his life shall lose it, and whosoever will lose his life for My sake and the Gospel's shall find it.' No one requires us to leave. No one has required us to leave. Our people need us now more than ever before in the whole history of the Mission. I cannot foretell the future. I cannot guarantee that all will be well--that we shall all come through unscathed. One thing only I can guarantee is that, if we do not forsake Christ here in Papua in His Body, the Church, He will not forsake us. He will uphold us; He will sustain us; He will strengthen us, and He will guide and keep us through the days that lie ahead . . . Let us trust and not be afraid." The Bishop's message was then duplicated, sent by land messengers to stations which might not have been able to hear it by radio, so that all the Missionaries would be able to receive it. Early in March, by which time Samarai had had its first air-raid, the Bishop set off in the mission vessel, "The Maclaren-King," to visit all mission stations, probably for the last time before invasion came. He had a narrow escape from death on March 10th, when "The Maclaren-King" was fired upon by a Japanese seaplane. On the beach at Buna he also had a narrow escape from Japanese bullets. In the northern regions he travelled by night to escape detection by enemy planes. But all stations were visited and the staffs encouraged. On July 22nd, Japanese armed forces landed at Gona, where there is an Anglican Mission, school and hospital. By August 3rd they had captured Kokoda, and were making their way along the Kokoda Trail over the Owen Stanley Range towards Port Moresby. 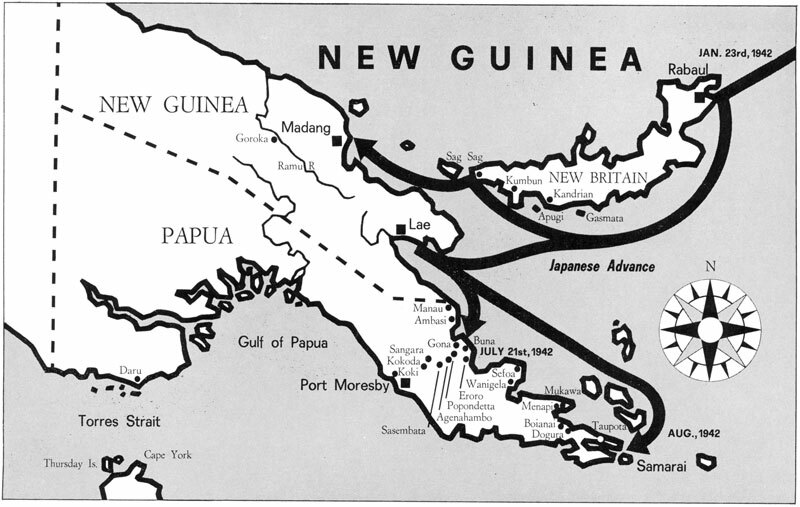 By September 10th the enemy was only 40 miles from Port Moresby and through the gap in the Owen Stanley Range, and by September 18th were as close as 28 miles. But that was their limit. However, this rapid advance brought many Anglican missionaries into the battle area, and the months of August and September were a period of time of anxiety for the Church in Australia. 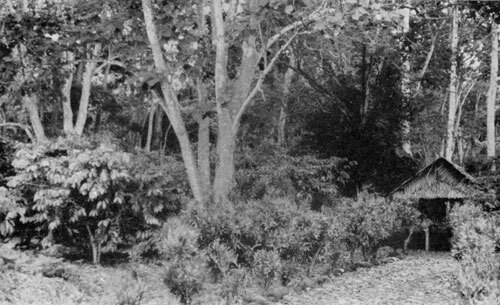 Concern was felt not only for the missionaries who had been stationed at Gona, Sangara and Isivita, but also for Archdeacon Romney Gill, working in the Mamba region, closest to the Japanese bases of Salamaua and Lae. At the end of August word was received of the first fatality. The death, on August 7th, was reported of the Revd. Henry Matthews, former Rector of Port Moresby and later Garrison Chaplain. He was a Victorian, well over 60 years of age, born in Ararat, and had given 33 years of his life to missionary service, first at the Mitchell River Aboriginal Station in Carpentaria, and then in New Guinea. He was killed, either shot or drowned, when a boat in which he was taking a group of half-castes to safety at Daru was attacked and shot up by a Japanese submarine. He had finished as an Army Chaplain in Port Moresby and was going to Daru to continue his ministry there to the people of mixed race who had had no ministration since the war began. Also killed with him was his faithful and devoted Papuan helper, Leslie Gariadi, of Boianai. On July 25th, Japanese soldiers first appeared at Sangara Mission, near the foot of Mt. Lamington. The white missionaries there were not far away, in the jungle hide-outs. The Japanese apparently announced their intention of returning the next day to destroy the mission station. All this was duly reported to the Mission Priest, the Revd. Vivian Redlich. He had not long been back in the region. He had been landed a short while before at Oro Bay, during a Japanese air-raid on nearby Buna. He was quite ill at the time, but insisted on returning to Sangara. On his way he found Japanese patrols all over the place, but managed to steer clear of them. On Sunday, July 26th, he was vesting for a celebration of the Holy Communion, when an excited Papuan Christian rushed up to tell him that the Japanese were at the Mission, and they had found out where he was. He was urged to flee at once. But he replied that it was the Lord's Day, and he would celebrate the Lord's Service. This he did and then he collected a few belongings and set off deeper into the jungle. Two days later, somewhere in the jungle, he wrote what was to be his last letter to his father in England. As it shows the spirit in which the Martyrs were facing the situation, we quote part of it: "No news of May (Sister May Hayman, of Gona, to whom he was engaged), and I'm cut off from contacting her . . . I'm trying to stick, whatever happens. If I don't come out of it, just rest content that I've tried to do my job faithfully." Most of the missionaries in the battle area had retreated into the jungle as the Japanese advanced, and were looked after by faithful Papuan Christians. But, as the advance increased, it became necessary to retreat deeper, and here danger lay, for they were in areas where the natives had not been brought within the Christian Church. This tragedy befell the staffs of the Sanagara and the nearby Isivita Missions. Their whereabout was known to members of a heathen tribe, who, in order to ingratiate themselves with the invader, captured them as they were crossing a river, moving from one place to another seeking safety, and handed them over to the Japanese. There were five missionaries here--the Revd. Vivian Redlich, Sister Margery Brenchley, Miss Lilla Lashmar from Sangara, and the Revd. Henry Holland and Mr. John Duffill from Isivita. Lucian Tapiedi, the Papuan teacher-evangelist at Sangara, who had accompanied the missionaries in their travels, protested to the Papuan captors that they were good people who were in the country to help them. But it was in vain and, for his trouble, he was struck down by a heathen Papuan with an axe and killed. On August 6th the others were taken to the beach at Buna, beheaded, and their bodies thrown into the sea. 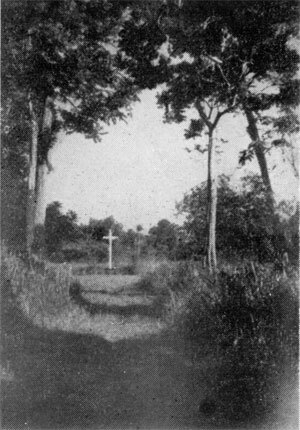 The site of the martyrdom of the Gona Missionaries. Livingstone, and his people made them welcome. They built for them a bush cottage in the jungle not far from the village, and cared for them. It was hoped they would be able to stay here till the trouble was over. But disturbing news of Japanese activities continued to reach them and, on August 8th, Fr. Benson decided they would have to move on and avoid possible trouble for the village if the people were discovered hiding white people. That night they were joined by a party of five Australian, five American and five Papuan soldiers. it was decided to keep all together. The soldiers wanted to get back to Port Moresby, and urged the group to make towards Popondetta and then cross over the saddle of Mt. Lamington to reach Port Moresby. It would be very heavy going. Fr. Benson preferred to go the other way, to the Ioma region to join up with Archdeacon Romney Gill, where they would be safe until fighting ceased. But he allowed himself to be persuaded, and at dawn next morning they set off. They had many experiences evading Japanese patrols, and they worked out a plan as to what they would do if they were surprised. Not far from Popondetta they ran into a Japanese ambush. Firing started, and all scattered according to the pre-arranged plan. Fr. Benson lost the women and the rest of the party, and never saw them again. They wandered in one direction and he in another, all lost in the jungle. Late in August the women were found by pagan Papuans and were betrayed to the Japanese. They were locked up in a wire-built coffee store, quite close to Popondetta. They were offered food from time to time, but, as they put out their hands to take it, it was withdrawn. Next day they were taken on to the coffee plantation to a place where graves had been dug. Here they were bayonetted and their bodies thrown into the graves. Fr. Benson wandered about for several days, weary and famished and completely lost. Eventually he came to a Japanese camp near Buna, where he tried to surrender, but no one seemed to be interested in him. Eventually he was arrested. He had a few face slappings, but otherwise was well treated. He accompanied the Japanese troops from place to place for a while, and then it was decided to send him by ship to Rabaul. He was taken off by a cruiser and spent some time in the military prison at Rabaul, where conditions were appalling. Later, suffering from beri-beri, he was sent to join the Roman Catholic Fathers on a nearby Roman Mission at Kokopo which had been turned into a prisoners' camp. Here his life was saved and he was nursed back to health. He survived the war, and was later able to return to New Guinea. August, 1942, had been a tragic month for the Diocese of New Guinea. In addition to the loss of so many faithful servants of God, two other blows were suffered. The military authorities took over the mission vessel, "The Maclaren-King," during the month, and a further Japanese force landed at Milne Bay in the south-east to start another drive to Port Moresby. This altered the whole situation and, at the end of September or early October, all women missionaries in unoccupied territory were evacuated to Australia. Little of the happenings in occupied territory was known to Church people in Australia at the time. The story gradually began to unfold when Allied military authorities began enquiries after the Japanese had been driven out of Papua. Prior to that, news was scanty and occasionally conflicting. In October, 1942, word was received that the staff of the Gona Mission had been executed and that the staffs of the Sangara and Isivita Missions had been imprisoned. In November word was received that Archdeacon Romney Gill was safe, living in the bush in the Ioma area, being looked after by Papuan Christians. But his mission station had been destroyed. It was May, 1943, before news reached Australia that the staffs of the Sangara and Isivita Missions had been put to death. The news was, unfortunately, made public in the press before the relatives had been notified. The Japanese had eventually been cleared out of Papua by January 24th, 1943, and the military authorities began their enquiries shortly after. No trace was found of Fr. Benson, nor had a grave been found for him. In June a message from the Red Cross was received that Fr. Benson had been seen alive and reasonably well as late as November, 1942, and it was thought he had been taken to Rabaul. 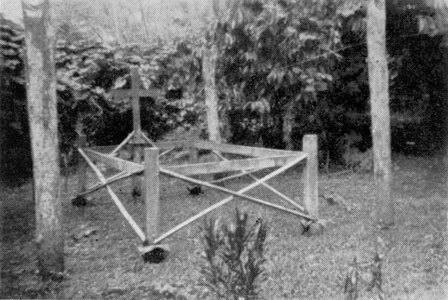 Enquiries about the teacher and nurse from Gona led to Papuans showing the authorities the graves of the women and of Lucian. In February, 1943, they were exhumed for identification and properly interred near the mission station at Sangara. In May, 1943, the Bishop was able to visit once again the mission stations that had been in the former battle area. Accompanied by Padre Arthur Bell, Assistant Chaplain General, he set out. Devastated mission stations and sad news greeted him wherever he went, but he was able to encourage and exhort the Papuan Christians, the large majority of whom had remained faithful. It was a solemn moment for him when he visited the graves of the Martyrs at Sangara. "For years the Mission had desired to expand. The area of intended expansion was one through which we had passed a few days before. This was the area where unfriendly natives had betrayed our brothers and sisters--the Revd. Henry Holland, the Revd. Vivian Redlich, Mr. John Duffill, Sister Brenchley and Miss Lashmar. This had been the cause of their being handed over to the Japanese. It was then realised that, had this area been opened up, these servants of God might not have died." The response to the appeal for help by Bishop Newton had been very little, and the new area had not been opened up. Australia, just recovering from the depression, was pre-occupied with her own affairs and not ready to come to the Bishop's assistance. So an opportunity was lost, with fatal results. Another loss was yet to come to light. In 1944 news was received that the Revd. John Barge, Mission Priest at Apugi, in the New Britain area of New Guinea, had suffered death at the hands of the Japanese. New Britain was then in the Diocese of Melanesia, but was transferred to New Guinea Diocese after the war. Thus they died, faithful unto death. They chose to remain with their flocks rather than desert them in their hour of danger. They were Martyrs for the Christian Faith. Their deaths were not in vain. Their sacrifice inspired the Papuan Church, and it remained firm. Recovery after the war was rapid because of it. Had they deserted much of the work would have had to begin all over again. But they were faithful unto death, and we honour them. Once again the blood of the Martyrs became the seed of the Church. The Revd. Henry Matthews, Priest at Moresby. Although over 60 years of age, he refused to leave Papua when war came. When his military Chaplaincy was terminated because of his age he received the Bishop's permission to move to Dogura, but first wished to visit Darn and give ministrations to isolated Christians there, and was killed en route. He was born at Ararat, Victoria. The Revd. Henry Holland, Priest at Isivita Mission, with 42 years of missionary service. He had gone to New Guinea as a lay missionary in 1910 and worked amongst coastal Papuans. In 1921 he was asked by Bishop Henry Newton to explore the Mt. Lamington area with a view to beginning work there. He chose the Sangara plateau as his centre and, after a year, had a Church and school built. Both were well used. He came from New South Wales. The Revd. Vivian Frederick Barnes Redlich, Priest at Sangara Mission. Ordained in the Wakefield Diocese in England in 1932, he came to Australia to join the Bush Brotherhood of St. Andrew and was stationed at Winton, Queensland. He then offered for service in New Guinea and was accepted. The Revd. John Frederick Barge, Priest at Apugi Mission, New Britain. An Englishman, he came to Australia in 1926, and became an orchardist in the Stanthorpe area of South Queensland. He was ordained in Brisbane in 1932, and was appointed as assistant in the Parish of St. James, Toowoomba. He went to New Britain in 1935. Sister Margery Brenchley, Mission Sister at Sangara. An Australian nurse, from Holy Trinity, Fortitude Valley, Brisbane. Sister May Hayman, Mission Sister at Gona. An Australian nurse, trained in Canberra, engaged to the Revd. Vivian Redlich. Joined New Guinea staff in September, 1936, was stationed first at Dogura, then at Boianai, before being sent to Gona. Miss Lilla Lashmar, Mission Teacher at Sangara, who was from Adelaide. Miss Mavis Parkinson, Mission Teacher at Gona. An Australian, from the Parish of St. Paul's, Ipswich, Queensland. A member of the Comrades of St. George. Mr. John Duffill, Mission Builder at Isivita. An Australian, from Holy Trinity, Woollongaba, Brisbane, who should have been on furlough, but elected to remain in Papua. Lucian Tapiedi, Papuan Teacher-Evangelist at Sangara (from Taupota). He trained at St. Aidan's College, Dogura. Leslie Gariadi, Papuan Evangelist (from Boianai), assisting the Revd. Henry Matthews at Port Moresby. He trained at St. Aidan's College. 1946: The site of the Martyrdom of the Gona staff was dedicated and made a shrine. 1948: First record of celebration of New Guinea Martyrs' Festival. This was at Gona. 1948: Martyrs' Memorial School, now at Agenahambo, opened at Sangara. A.B.M. gave £5000 towards it. Psalm 116. 1st Lesson, Wisdom 3: 1-9; 2nd Lesson, Rev. 6: 9-11. Collect as for the Eucharist. Psalm 130. 1st Lesson, Zeph. 3: 7-end; 2nd Lesson, Romans 8: 18-32. Collect as for the Eucharist. Psalm 126. 1st Lesson, Wisdom 5: 1-15; 2nd Lesson, 2 Cor. 6: 1-10. Collect as for the Eucharist. O Almighty God, who didst enable thy missionary and Papuan martyrs in New Guinea, in the day of sore trial and danger, to be faithful to their calling and to glorify thee by their deaths: Grant we humbly beseech thee that, by the witness of these thy martyrs, thy whole Church may be enriched and strengthened for thy gathering into thy fold of thy children in all lands; and that we thy servants, following the example of their steadfastness and courage, may labour the more fervently for the coming of thy kingdom, and may so faithfully serve thee here on earth that we may be joined with them hereafter in heaven. Through thy Son Jesus Christ our Lord, who liveth and reigneth with thee and the Holy Ghost, ever one God, world without end. Amen. Who shall lay anything to the charge of God's elect? It is God that justifieth. Who is he that condemneth? It is Christ that died, yea rather, that is risen again, who is at the right hand of God, who also maketh intercession for us. Who shall separate us from the love of Christ? Shall tribulation, or distress, or persecution, or nakedness, or peril, or sword? As it is written, for thy sake we are killed all the day long; we are accounted as sheep for the slaughter. Nay, in all these things we are more than conquerors through him that loved us. For I am persuaded, that neither death, nor life, nor angels, nor principalities, nor powers, nor things present, nor things to come, nor height, nor depth, nor any other creature, shall be able to separate us from the love of God, which is in Christ Jesus our Lord. GOSPEL: St. John 12: 20. There were certain Greeks among them that came up to worship at the feast. The same came therefore to Philip, which was of Bethsaida of Galilee, and desired him, saying, Sir, we would see Jesus. Philip cometh and telleth Andrew: and again Andrew and Philip tell Jesus. And Jesus answered them, saying, The hour is come that the Son of Man should be glorified. Verily, verily, I say unto you, Except a corn of wheat fall into the ground and die, it abideth alone: but if it die, it bringeth forth much fruit. He that loveth his life shall lose it; and he that hateth his life in this world shall keep it unto life eternal. If any man serve me, let him follow me; and where I am, there shall also my servant be: if any man serve me, him will my Father honour. Now is my soul troubled; and what shall I say? Father, save me from this hour; but for this cause came I unto this hour. Father, glorify thy name. Then came there a voice from heaven, saying, I have both glorified it, and will glorify it again. The people, therefore, that stood by, and heard it, said that it thundered: others said, An angel spake to him. Jesus answered and said, This voice came not because of me, but for your sakes. Now is the judgment of this world: now shall the prince of this world be cast out. And I, if I be lifted up from the earth, will draw all men unto me.